If you want access to expert Sterling and Alexandria trenchless sewer line repair service, call (703) 541-8489 today. We offer quick, affordable service and free estimates. You can find our valuable online specials and coupons when you click here. When you have a broken or damaged sewer line, having it repaired in the least invasive way possible is paramount. Digging up large sections of earth to expose the broken line is disruptive and quite messy. That’s why trenchless options have been developed, and why they are being used with increasing frequency by forward-thinking plumbers. Check out what your neighbors throughout Sterling and Alexandria have to say about us by clicking here! What’s the Point of Trenchless Repair? Trenchless sewer line repair was developed and is used to fix aging or damaged sewer lines without having to dig a big trench and disrupt a property or uproot the people around it. Trenchless sewer line repair is cleaner and safer than traditional sewer line repair, and typically costs quite a bit less. It can be used for sewer lines on your residential property, or commercial sewer lines. There are a handful of different methods used to perform trenchless repairs and replacement, each designed to be less invasive. 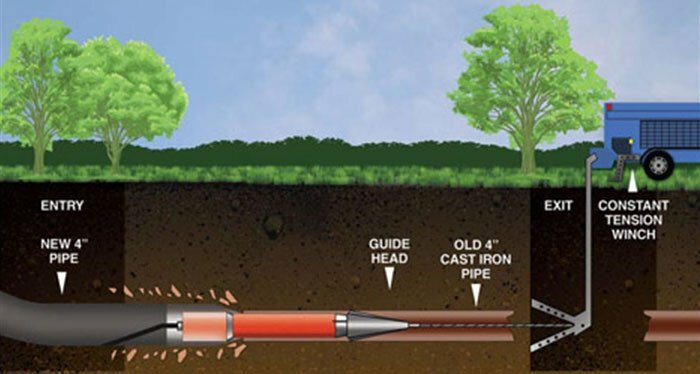 Pipe bursting is one of the more common methods of trenchless sewer line repair. With this method, holes are dug at either end of the damaged line, and a new pipe is inserted into the old one, causing it to burst. The older pipe ends up in pieces in the earth, and the new pipe takes over, with the contents of the original pipe in the new one. This type of treatment is still an undertaking, but it is less involved and invasive than the standard way of doing things. If your sewer line is in trouble and needs repairs or replacement, it is obviously not a DIY kind of job. No homeowner has the equipment or experience to repair sewer lines, but you can’t just choose any old service provider, either. Safety and environmental concerns are a high priority when it comes to repairing and replacing sewer lines, so finding a licensed plumber with a wide range of experience and all of the necessary credentials is crucial. When you find a great service provider, you can just sit back and let them get to work, because peace of mind is the ultimate benefit for homeowners. If your sewer line is in need of repair and you’re looking for a non-invasive solution, call Cardinal Plumbing, Heating & Air Inc. at (703) 541-8489 in the Sterling, Alexandria, or Reston, VA areas. We will send one of our experts to assess the situation and offer a long-term solution.